Discover social platform here! Read more at Gallant Trade Copier Review! At the end of 2013 Gallant introduced its social trading platform – Trade Copier. It is an automated copy trade platform that allows all Gallant clients to follow strategies developed by advanced traders known as Leaders. We will cover all important aspects of Gallant Trade Copier social network in this review. Gallant offers free live trading account that can be opened in the following currencies: USD, EUR, GBP, CHF, JPY and AUD. However, the strange fact is that almost 99% of strategies available operate only in USD. Therefore, allowing the choice of other currencies is simply meaningless. If you want to copy strategies at Gallant Trade Copier trading network, you have to create USD account, which might not be convenient for everyone. Minimum investment amount is $500, though with some strategies this could be much higher. Unfortunately, there is no Gallant Trade Copier demo account offered. There is no need to look for the best broker for Gallant Trade Copier, since this platform offers fully integrated broker solution. As for the spreads, at Gallant they depend on the account type and initial account balance: Micro Account (min. Deposit $250) – 2 pips; Standard Account ($2500) – 1.5 pips; Pro Account ($50000) – 0 pips, but instead special commissions have to be paid. There are no extra fees associated with Gallant, except for the spreads. The spread for EUR/USD currency pair is 2.5 pips. In our opinion this set of parameters is pretty basic, although there is no strong need in using filters simply because of the limited Leaders’ pool. Hence, you can review each system at the platform manually. As you might have noticed at the image above, Gallant Trade Copier investment platform does not provide any features to show the trading history or currently open trades, except for the daily trade history email sent by Gallant. However, it is still quite disappointing that such crucial analytical data is not decently provided. On the other hand, the current account balance and equity of strategy providers is openly shared. One of the first serious pitfalls of Trade Copier Gallant social trading platform is almost total absence of risk and money management tools. For instance, Gallant does not enable you to set any Stop Loss, Trailing Stop, Floating Drawdown and so on. Additionally, you cannot close all positions to secure your account from losses. The only feature available to somehow manage your money is called “Copier Mode”. Technically, you have to choose proper Trade Copier Gallant copy trade method: 1) Lot Allocation – copying every single trade in the identical size order as the account of strategy developer; 2) Percent Allocation – copying the trades in equal percentage and proportionally of the strategy provider’s account balance. We should inform you that there is a possibility to track your actual performance from the Gallant MT4 terminal. There is no need to worry if you do not have it. MT4 terminal is downloadable from the Gallant website for free. The MT4 terminal permits you to manually close any trades opened by copied systems. Furthermore, Gallant has provided an access to your charts by introducing their VPS with online interface on smartphones or tablets. Gallant Trade Copier investment network allows all clients to develop and introduce their trading strategy and thus become Leaders. We tend to believe that accepting everyone is not good, especially when there is no quality evaluation process and no trading requirements for the strategy are applied. Therefore, the only obligatory condition is to create an account and start trading. 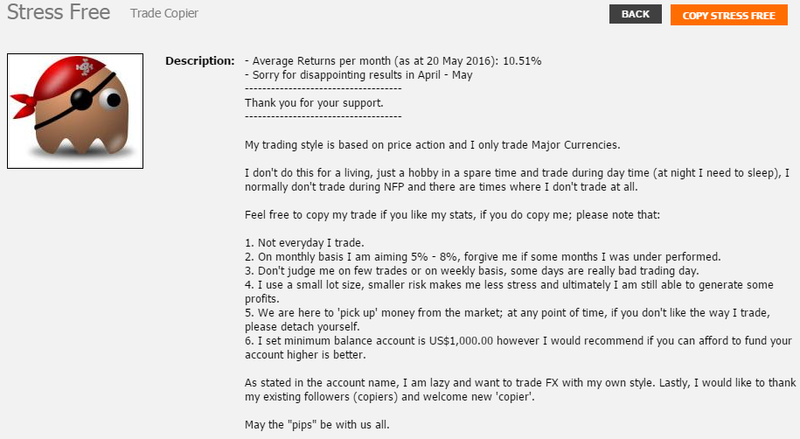 Our Gallant Trade Copier review discovered that Leaders have to trade with real money, meaning that they expose their live accounts to risk. Moreover, we have witnessed different profiles that demonstrate the account balance more than $10000. Since Equity/Balance stats are openly shared, you can observe even bad performing systems – this info is transparent. However, good performance is encouraged and awarded as signal providers are paid for the extra profits they make. So it might be worth it. Now we would like to draw your attention to the issue of strategy providers’ turnover. Although this is an ordinary practice for social trading platforms to remove unsuccessful systems and replace them by sustainable ones, for Trade Copier this happened pretty quickly. As earlier Gallant Trade Copier reviews admit, several months after network launch there were as many as 40 strategies to copy. However, by the year 2015 this amount had been reduced to 11. Now it is 9. In our opinion, such a rapid decrease in strategies is a warning sign both for the proficiency of signal providers and also for non-explicit policy for strategy replacement. This is strange considering the fact that there are no quality standards for strategies to follow. Our review has identified that Gallant Trade Copier fees are linked purely to the successful activity of Leaders. Furthermore, right now there is only one fee on this platform – for the performance. We should also speak about the inevitable slippage you can experience at Gallant Trade Copier social trade. Most social trading networks provide the necessary data to analyze the incurred slippage, although it is impossible at this platform due to the absence of full trading history. After analyzing the copied trades at Gallant on our own, we found out that the slippage is approximately 2 pips per trade. Take into account that some strategies can be quite expensive and thus may require high initial investment, e.g. $10000. The majority of Gallant Trade Copier complaints comes from the poor social interaction features. There is no communication bridge between traders and subscribers, not even a single thread in a forum. Additionally, followers cannot leave comments or write reviews on strategies they tried. Rating is disabled as well and there is no opportunity to learn different Gallant Trade Copier opinions. The only thing that somehow correlates to the social interaction is the description of strategies that Leaders provide. Besides, It is unknown why Gallant has not ensured Twitter or Facebook integration. At Gallant Trade Copier copy trading you can contact client support using the following methods: email, phone or live chat. Despite the previously discussed pitfalls of the platform, customer support is more or less good. Their response time by email takes usually 1 day, call center is accessible as well. The website operates in English, Spanish, Chinese, Polish, Arabic and Russian. However, there are no useful tips for Gallant Trade Copier, because Trade Copier guides do not present real value and explain pretty basic information. Another fact to give on your own judgement is the location of Gallant – British Virgin Islands. 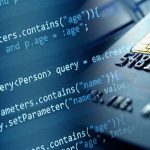 Even though most payment methods do not include commissions, the situation is quite different with wire transfers. The problem is that if you use wire transfers, you will have to pay an enormous fee of $60 for the funds withdrawal. This is an obvious Gallant scam feature. As the money is held in the account on the British Virgin Islands, you will have to pay a small deposit fee for the wire transfer once again. Subscribe to our mailing list and get all the latest reviews, news and special promotions straight to your inbox. 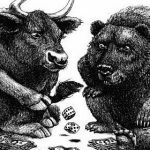 What can FX traders learn from gamblers? Investment in financial markets carry significant risk and BestSocialTrading.com can not be held responsible for the outcome of such investment. 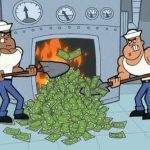 On occasion, BestSocialTrading.com will receive a fee for referring users to certain brokers or social trading platforms, however this does not influence our reviews and we remain 100% impartial. All the information on this site provided free of charge and does not constitute investment advise. Any opinions expressed in reviews on this site is purely the opinion of the author.